Texas lawmakers have decided to do away with laws that restrict the open carry of blades longer than five and half inches. From September 1, Samurai Jacks and Katana Joes can rub shoulders with reincarnations of Billy the Kid. 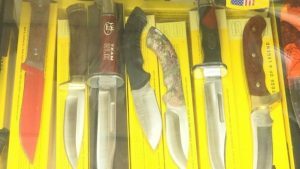 According to Dianna Knipp, owner of Charlie’s Knife Shop in El Paso, “Some other states are looking at us as a return to the old Wild West”. She said, “I think it will be similar to the open-carry law in Texas [for firearms] in that it will be a big stir for a while and then it will die down”. House Bill 1935, which eliminated knives from the list of items that are a crime to carry in Texas, was passed in June with bipartisan support. Texas law had made carrying of blades longer than five and half inches illegal. The length of the blade is measured from the tip to where the steel enters the handle. Under the new law, knives, just like guns, will be banned in places that include churches, hospitals, courtrooms, and schools.